The Unprecedented. : Geode, Gold & a Giveaway! Todays post is very special...because, I`m having a GIVEAWAY!! Wahoo! The first giveaway of the new year! I hope you`re all excited! I came across an Etsy shop called Magic Loot Designs by Simona Van Vliet a few weeks ago and was in love with the peices I saw. In particular, the gemstone necklaces really stood out to me. Simona creates amazing pieces using sterling silver, goldfill, 24k gold, gemstones, fossils, and vermeil, and is inspired by the California nature around her. I thought If I like these, I`m sure you all would too! To see all of Simona`s jewelery and other shops click HERE. 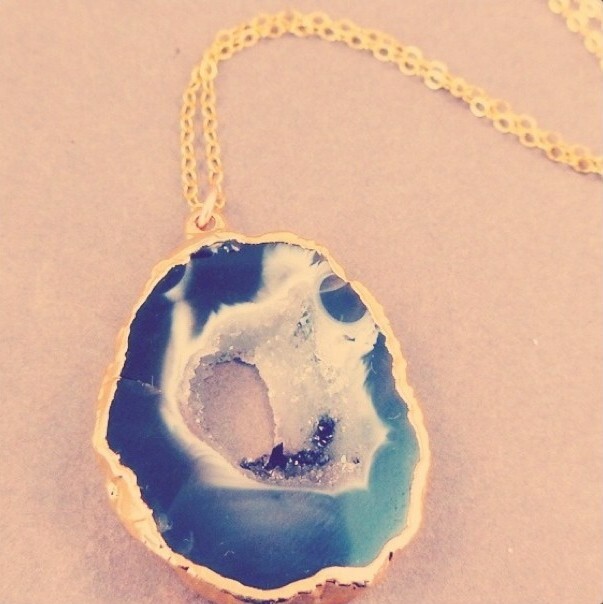 I am giving away the Geode Slice 24k Gold Trim Agate Necklace - so pretty! Perfect for your Valentines Day outfit! Q: Why did you start designing? A: I first began designing and making jewelry as a way to relax. I worked as a special education teacher, which was a highly demanding job. Making jewelry at the end of the night was my way to unwind. I find the process of creating to be relaxing and meditative. A: I get my inspirations from nature. I love the look and feel of natural elements. My line consists of mostly natural gemstones, gold layered fossils, and leaves. I think it is important to look around you and appreciate the small wonders that nature gives us. Q: Which celebrities would you want to wear your line? A: Sarah Jessica Parker- because she is just so glamorous in everything that she wears! Jennifer Aniston - she seems more earthy to me, and can also appreciate the natural elements in my line of jewelry. I believe my jewelry is both glamorous, yet also subtle enough to be worn everyday. Q: Any advice for beginning jewelery designers? A: Design from your heart. Original artwork comes from people who are not afraid to take a risk and try something new, so believe in yourself. This will be the easiest giveaway to enter because you barely have to jump through any hoops! Step 1: Like The-Unprecedented on Facebook HERE. Step 2: Comment on this blog post telling me what you're favorite Magic Loot Design piece is and leave your email address. Click HERE to choose. Step 1: Like The-Unprecedented on Twitter HERE. Step 2: Comment on this blog post telling me that you`ve followed through Facebook AND Twitter. This giveaway will end on Monday January 30th at the end of the day! Good luck! I love the Tibetian quartz point necklace - 24k gold quartz pendant - onyx chain!!! Yay lovely giveaway! It was tough to pick one favorite, but I think I'd go with the Tibetian quartz point necklace. great pieces! love the spirit quartz necklace! this necklace is GORG!! I obviously LOVE the unprecedented on Facebook and twitter and my favourite piece is the necklace you're giving away, stunning. It's so hard to choose but my favorite is the Uvarovite Green Garnet Druzy 24k gold dipped Necklace One Of A Kind pendant. So gorgeous!! Liked through Facebook and twitter! !